The New Romantic era of the early 1980s was full of androgyny and interesting music. Some people loved it, some hated it, and certainly the outrageous fashions can seem cringe-worthy in retrospect. But it stood as a reaction to the bleak, stripped-down utilitarianism of 1970s punk. It was also a wonderful period for the memorabilia collector. Records came on coloured vinyl, printed vinyl, in odd shapes, and with all manner of 12-inch dance mixes. Add to that various forms of merchandise for the bands at the more popular end of the market, such as Culture Club, and there’s an Aladdin’s cave of memorabilia to be had. Who Were The New Romantics? 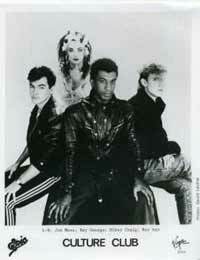 The New Romantic era began in 1979 and ended around 1983. Although the movement started life in a pair of London clubs (The Blitz and Billy’s), it quickly grew. The music was much fuller than punk or post-punk, more danceable and had a much wider appeal. Many of the New Romantic bands, including Duran Duran and Adam and the Ants, went on to become major stars. In terms of fashion and style, New Romanticism emphasised the outrageous and colourful. It was also far more accepting and welcoming of gay people than any previous movement, which was reflected in the androgyny of some artists (Boy George and Marilyn in particular). The advent of the music video and MTV certainly helped spread the word, but like many musical eras, the New Romantic movement soon came and went. Although there are other worthy products, the main focus for New Romantic collectors is recorded music. There was a very wide range of vinyl available. Releases came in limited editions on coloured vinyl, in picture sleeves, laser-etched vinyl, as well as discs printed with pictures and in curious shapes. In the post-disco era there was even interest in dance mixes, all of them 12-inch releases. In excellent or mint condition, these can represent moderate investments. It does take research, however, to discover exactly what is available in this category. Even collecting a single artist can be quite challenging when it comes to record releases. With so many variants, tracking down items can prove difficult, especially when foreign releases are added to the equation. But there’s real satisfaction to be gained – for the collector more than the investor – in slotting in that final missing piece of vinyl to the collection. It’s possible, too, to try and collect all the New Romantic releases, although the definitions of exactly who was New Romantic and when the period started and ended are very fluid. The original vinyl remains quite cheap, in part because the music has all been reissued on CD. Even promotional vinyl fetches less than £10 in most instances. That helps to make this era still extremely collectible. Over time the amount of vinyl will decrease and inevitably rise in value, even if it's not by much. There are plenty of other pieces of merchandise worth snapping up while values remain low. Books and magazines, if in excellent condition, can prove to be good value for money. Record companies issued promotional items for some artists, and those from different countries (a number of artists did very well in American and Japan) expand the possibilities. Japanese vinyl in particular can prove very interesting in all its varieties. The best sources for all these are online memorabilia stores and Internet auction sites. The fact that prices remain so low means that amassing a good collection on a budget is very feasible, including signed promotional pictures. The main thing to remain aware of when collecting is the quality of the item you’re buying, especially if you can’t inspect it in person first. The New Romantics remains a fertile area for both fans and collectors, although prices will inevitably rise in the new few years.